As I mentioned yesterday, Little Leaf Farms is located in Shirley, a 14 acre-site within the Devens Regional Enterprise Zone. This zone is the former location of the 4,400-acre Fort Devens military base and is now administered and regulated by the Devens Enterprise Commission. Within this zone, you'll now find private residences, schools, open parkland, and numerous businesses. Paul Sellew, the founder of Little Leaf Farms, worked with MassDevelopment to acquire the 14-acre site, investing a significant amount of his own money into this endeavor, indicative of his confidence in this project. A three-acre facility was constructed, with 1 hectare of growing space within the greenhouse, which is the equivalent of about 2.47 acres. The construction of the facility included numerous aspects intended to conserve energy, be more sustainable, and contribute to the success of this hydroponic operation. For example, the Devens site was specifically chosen so they could use more affordable and sustainable energy, as Devens uses a significant portion of solar energy. In addition, the glass used in the construction of the greenhouse was specially designed to maximize the use of natural sunlight. During the winter, when there will be much less natural light for the greenhouse, they will use LED-powered grow lights, which use 40% less electricity than conventional grow lights. The greenhouse was constructed with a north-pitched roof so that it could collect rainwater, which is then stored in a 2 million-gallon basin located to the rear of the building. One inch of rain provides them about 75,000 gallons of water and their basin is currently two-thirds full. The rainwater is their primary water source and their goal is not to use any other water, absent any significant drought. Interestingly, despite the scarcity of rain this summer, the farm still acquired more water than they needed for their purposes. Thus, they haven't had the same drought problems which have plagued California this year. None of their water is wasted as it is all used by their leafy greens. Their entire system uses about 90% less water than is needed for traditional field-grown lettuce operations, significant savings of an important and limited resource. Before the water from the exterior basin can be used in the greenhouse, it is first disinfected with UV light, using the machinery pictured above. This ensures the water isn't tainted before being used to irrigate the leafy greens. Once the water has been disinfected, it is then stored in this interior water tank, where it will then be used for irrigation, as well as partly for the temperature regulation system. Most of the operation of the greenhouse is automated, meaning much less labor is necessary, and they currently only have ten employees. They do need to have one of their two growers present every day of the week. The growers include Pieter Slaman, the Head Grower and a fourth-generation Dutch lettuce grower, and Tanya Merrill, the Assistant Grower, who graduated from Cornell University last year with a horticulture degree. Watching the entire process is amazing, seeing how smoothly it runs, from seeding to packaging. And it all begins with the pelleted non-GMO seeds, like those pictured above, which are obtained from Holland. The seeds are expensive and Little Leaf purchases a large amount of seeds on a regular basis as they harvest on a regular basis. This is Juan, the "father" of the greenhouse, as he is responsible for seeding. The entire process begins with an empty, long white plastic growing tray, referred to as a gutter. Next, a strip of "horticultural stonewool" (pictured above) is placed into each tray. The stonewool is a fibrous substitute for soil and is actually made from crushed and melted rock basalt, which eventually gets spun into wool. This stonewool is specifically designed to hold water and air, and is also natural and inert, meaning it doesn't provide any nutrition to the plants. Because their seeds are grown in stonewool, and not soil, their leafy greens currently cannot be labeled as organic. Hydroponics and organic certification remains an area of contention. Seeds are then added to the stonewool and the tray is then conveyed on a belt to the greenhouse. For the first three days of their life, the newly seeded trays, are kept beneath the rest of the trays, gaining the shade they need for germination. Once they have sprouted, then the trays will be automatically moved to the same level as the rest of the plants. Within the green house, there are 12 production lines, with a total of 2130 gutters. The oldest plants are located the closest to the conveyor belts, and the gutters will move forward each day. In addition, as the plants get larger, the space between the gutters increase so that each plant gets sufficient light as crowding could create too much shade. Each day, 120 gutters, per line, will be harvested and it takes only 25 days from seed to harvesting. As such, each gutter could be seeded and harvested about 14 times during the course of a year. They do not harvest at full maturity, harvesting at a time when they feel the leafy greens are at maximum flavor. Maintaining the balance of the lines and gutters is very important to their operation. This is a gutter which I witnessed being moved to the conveyor belt, ready to be harvested, and headed to the cutting room. Paul stated that their projected annual yield should be in the low millions of pounds! Hypothetically, if their total yield were 2,000,000 pounds, that would equate to 1000 tons, or about 400 tons per acre. Now, let's compare that to the average yield of leafy greens on an acre of land in California, which is only 12 tons. Little Leaf is producing as much leafy greens on one acre as it would take for over 33 acres in California. That is incredible and is a massive savings in valuable resources. As I said yesterday, lettuce production occurs on about 323,000 acres, but if the Little Leaf process was used, you could decrease that amount down to only 9700 acres! Little Leaf uses a hydroponic system known as "nutrient film technique," where, in short, water containing nutrients, feeds the plants. Little Leaf purchases all of the various ingredients separately including nitrogen, phosphorus, potassium, and micronutrients, and then creates their own nutrient blend, carefully selecting each ratio. They do not use any chemical pesticides, opting instead for more biological control. Insects which could cause problems include aphids and white flies, and one of their means to controlling this threat is through parasitic wasps which live within the greenhouse. The greenhouse is also "over pressure enclosed" so that when you exit the greenhouse through a door into the cutting room, you will confront a large burst of air, which is partially to keep the greenhouse cooler in the summer and all helps to prevent insects from flying into the greenhouse. From the greenhouse, plants that are ready for harvesting move on a conveyor belt to the cutting machine, where air is blown to ensure the leaves are raised before cutting. The leaves are sorted, and then maybe mixed, dependent on what is needed for the final product. For supermarkets, the leafy greens are sent to a packaging machine, which places mixed greens into 5-ounce bags, which use 90% less plastic than some of the plastic "clamshells" used by other lettuce companies. The bags are then boxed, refrigerated and shipped out the next day. With California and Arizona lettuce, it will take a number of days to get trucked across the country. Little Leaf lettuce could be on your table the day after it is harvested. In addition, harvesting, cutting and packaging at Little Leaf occurs in a matter of minutes. On a typical field-grown lettuce farm, the time from harvesting to packaging is probably measured more in hours. For food service distribution, they sell four-pound bulk boxes, and this is one of the only times there is any human intervention, but even then, the employees wear gloves to maintain hygienic practices. The trays which once held the harvested plants are emptied and then disinfected by steam so that they can be reused. And the process begins anew. Where is the lettuce and arugula you eat grown? Most likely, it comes from California or Arizona, transported across the country to New England by truck. You might find a small amount of local lettuce at farmers markets, grown on farms which can provide leafy greens only within a specific season. However, there is now a new option, a compelling lettuce farm, located in Shirley, Massachusetts, which can provide leafy greens year-round and which should serve as a model for the future of lettuce farms across the country: Little Leaf Farms. First, let's explore a little bit of the fascinating history of leafy greens, to see its importance to ancient cultures. It is thought that the ancient Egyptians were the first people to cultivate lettuce though they generally didn't eat it. Instead, they used its oily seeds and the milky sap that oozed out when you broke a piece of lettuce. That milky sap would later provide lettuce its name, based on the Latin word "lactuca" which means "milk." The Egyptians felt that milky sap was an aphrodisiac and dedicated it to Min, their fertility god. Arugula was also once thought, by the ancient Romans, to be an aphrodisiac. Who would have thought a simple salad could enhance your love life? For the ancient Greek and Romans, lettuce was considered more of a food source, though initially they served it at the end of a meal, as they believed it made you sleepy. Later, they felt that lettuce would help to stimulate your appetite so they started serving it at the start of a meal, though they also felt it helped digestion, so they also might serve it at the end of a meal. Lettuce was first brought to the Americas by Columbus but it didn't start to be planted as a regular crop until colonial times. Currently, lettuce is the third most consumed fresh vegetable in the U.S., behind tomatoes and potatoes, with the average American consuming about 25 pounds of lettuce each year. Lettuce can roughly be divided into two types, head (like iceberg) and leaf (like romaine), though some divide leaf types into a few different categories. Breaking down lettuce consumption, Americans generally consume about 14 pounds of head lettuce and 11 pounds of leaf lettuce each year, with leaf lettuce consumption having grown in recent years. China produces the most lettuce in the world, about 56% of total production, while the U.S. occupies second place, with maybe 10% of total production. China consumes much of their own lettuce production and it is Spain which occupies the top place for lettuce exports, with the U.S. once again taking second place. The U.S. only export about 12% of their total production, with most of those exports headed to Canada, with smaller amounts to Taiwan and Mexico. Approximately 98% of the lettuce grown in the U.S. comes from California and Arizona, with California responsible for about 71% of all head lettuce production. Lettuce production occurs on about 323,000 acres, using a significant number of resources, from land to water. It is also considered very labor-intensive, especially for harvest and packaging. On an acre of land in California, the average yield is about 12 tons for leaf lettuce and 20 tons for head lettuce. This year's drought has also caused serious agricultural issues in California, pointing up a vulnerability in the system. However, there may be a way to counter some of the disadvantages of this land agriculture, to increase yields while still using less resources, including labor. Little Leaf Farms is leading the way in offering such a solution, with their own hydroponic, leafy greens farm contained within a three-acre greenhouse. Hydroponics is basically a way to grow plants without the use of soil, using mineral nutrient solutions to feed the plants. Though this type of farming has been available for over 30 years in the U.S., it hasn't caught on much until recently, and it still is only a tiny percentage of total farming across the U.S. For example, it is estimated that next year, there will only be about 3500 acres of greenhouses in the U.S. Other countries, such as Holland, have been more amenable to hydroponic greenhouses, and looking to such countries can offer beneficial advice to farmers in the U.S. Paul Sellew, the founder and CEO of Little Leaf Farms, paid careful attention to the work in Holland. Paul Sellew, who at six-foot eight-inches tall is someone most people need to look up to, grew up in Lebanon, Connecticut, working at Prides Corner Farms, which was started by his late father, Peter, and is currently operated by his brother, Mark. Paul graduated from Cornell University, in Ithaca, New York, with a degree in horticulture. Though it seemed farming was in his blood, Paul took a few years away from it to play professional basketball in Europe and South America. Upon his return to the U.S., he began his entrepreneurial career, starting with Earthgro, a composting business. Since that time, he has founded a number of different companies from Harvest Power to Backyard Farms. You might be familiar with Backyard Farms, which is a greenhouse located in Maine which hydroponically grows tomatoes. Their tomatoes can be found in many local supermarkets and are also served at some local restaurants too. Paul's latest endeavor is Little Leaf Farms, which he hopes to do for lettuce what Backyard Farms did for tomatoes. When I met Paul, and toured the greenhouse, I found him to be humble and passionate, engaging and intelligent. He was a down-to-earth person, lacking any pretension, and answered all of my questions without reservation. The greenhouse was thoroughly impressive and it is clear that this is a labor of love. The greenhouse has only recently started operations, having delivered its first shipments of leafy greens in July, and still needs work out a few kinks, but its potential is massive. In a world concerned with conserving natural resources, sustainability, climate change, and other such issues, Little Leaf Farms is a shining example of the potential for hydroponics. To some, the results of the poll were disturbing and surprising. It seemed to run counter to what they thought, or at least felt. However, it's likely that the poll results would be similar in most, if not all, other countries and regions as well. In short, most people don't know much about wine. The Guardian reported the results of a recent poll taken in France, asking people whether they considered themselves knowledgable about wine or not. France produces some of the best wines in the world, from Champagne to Bordeaux, and they have been doing so for many hundreds of years. You might think that because it seems to be such a vital cultural element of their country that its citizens would know plenty about wine. The reality is that is not the case. In the poll, 71% of the respondents indicated they did not consider themselves knowledgeable about wine and 43% of that group said they knew nothing at all. Only 3% considered themselves to be "well versed" while the other 26% said they "knew enough." So very few French people actually believe they know much about wine. That doesn't surprise me. Plenty of French people may drink wine, though consumption has been declining in recent years, but most people don't sit around discussing terroir, fermentation techniques and barrel aging. They simply enjoy a glass or two of wine, usually with food. They don't give wine much consideration, just enjoying the styles of wine they like. It is only a tiny minority who actively seeks out to learn more about wine, to study grapes and production methods. It isn't necessary to learn much about wine to enjoy it, so many people don't see much of a need to learn all about wine. That isn't any different from any other wine country or region. The majority of people in California aren't sitting around discussing and learning about wine either. Most people simply drink wine, without paying attention to the myriad of details behind its making. Again, it is only a small minority of people who want to learn more about wine. Like Spain, Italy, South Africa, Australia and any other wine region. It is really a niche subject. It is probably the same with other beverages as well, such as most Germans don't know much about beer and most Japanese know little about Sake. People generally drink such beverages, or not, and most don't care to learn all about such drinks. They are content just to drink and enjoy. Thus, France's poll about wine isn't really disturbing. It simply reflects reality and doesn't indicate a decline in wine interest. Most consumers have little reason to intently study wine, and there is nothing wrong with that. "What is called the traditional drinking cup or horn, kanzi, is conch-shaped and comes in different sizes, often decorated with silver. Because Georgians are famously hospitable people, an essential feature of the horn is that once filled with an appropriate libation, usually wine, it requires drinking to the bottom (bolomde) on each toast." Back in 2008, when I first tasted a wine from the country of Georgia, a former Soviet republic which is located in the Caucasus region, they were a rarity in the Boston area. It is only in the last few years that Georgian wines have started becoming more readily available in the Boston area. At the last few Boston Wine Expos, a number of Georgian importers and producers have showcased their wines, and I've eagerly tasted these wines, enjoying the unique, indigenous grapes, as well as some of their traditional wine-making processes, such as the use of qvevri, earthenware vessels used for fermentation and aging. In addition, Georgian wines present a taste of history as Georgia is often said to be the birthplace of wine, with archaeological evidence extending back approximately 8,000 years. Their use of qvevri also extends back to those earliest times, so modern producers using these earthenware vessels have a connection to the ancient past. As qvevri clearly affect the taste of the wine, it is actually like you are sampling a piece of history, and that is exciting. Last week, I had the opportunity to sample some more Georgian wines, as a media guest, at an intriguing tasting event held at the Matter & Light Fine Art Gallery, located on Thayer Street in the South End. Thayer Street is lined with art galleries and Matter & Light is located on a lower level. It is a small gallery, displaying works from contemporary artists from all over the world. Much of the works are abstracts, though there are also some figure studies. The art gallery made for an interesting venue for the wine tasting, a pairing of the beauty of the art with the aesthetics of the wine. The room was also large enough for the crowd that attended the tasting, and gave attendees something else to do, to admire the paintings, besides tasting the food and wines. Proceeds from the event tickets benefited the Ballets Russes Arts Initiative, a non-profit, based in Boston, that promotes creative exchange in the fine and performing arts between the U.S. and the post-Soviet region. They host numerous events, promoting the arts, including films, concerts, dances, plays and more. If you're interested in the arts of the post-Soviet region, then you might like to check out this Initiative. Numerous hors d'oeuvres were provided, catered by Bazaar International Gourmet, with stores located in Brookline and Allston. It is a specialty grocery store with a large selection of Russian and Eastern European foods. Some of the hors d'oeuvres were more traditional Georgian dishes, though they were not labeled so I'm not sure as to the identity of many of the dishes, though they were tasty, and went well with the wines. The wines were supplied by Georgian Toast, a Massachusetts-based boutique importer focused exclusively on wines from Georgia. I previously encountered their wines at the last Boston Wine Expo and you can check out my prior review for background on Georgian wines, background on Georgian Toast, and reviews of a number of their wines. Above, holding a bottle of wine, is Kosta Middleman, one of the passionate members of Georgian Toast. At this event, there were 12 wines available for tasting, from four different providers (Georgian Valleys, Jakeli, KTM, and Orgo), and included wines made from indigenous varieties such as Rkatsitelli, Mtsvane, Ojaleshi, and Saperavi and from specific regions including Kakheti, Khashmi, Lechkhumi, and Gurjaani. Some of the wines were fermented in qvevri while others were made with more modern wine-making practices. I'd previously tasted many of these wines, and retasted them again, finding them just as delicious and compelling as before, especially the 2012 Jakeli Wines Saperavi. There were three wines which were new to me, and they all deserve some attention. The 2014 Kakhetian Traditional Winemaking (KTW) Ia's Rosé is a semi-dry Rosé wine, with a 11.5% ABV, that is made from a blend of three grapes, Saperavi, Muscat and Mtsvane. The wine spends about 8-10 hours on the skins, giving it a bright pink color. It has a lovely aroma of red fruits and floral notes, and on the palate there are tasty flavors of strawberries and raspberries, with hints of rose petals, and a little tartness on the finish. It is crisp and easy drinking, perfect for the summer, though it is food friendly and you can easily drink it year round. The next two wines were produced by the Orgo Winery, which Georgian Toast recently started distributing in Massachusetts. Orgo is a small, artisan winery located in the Kakheti AOC in eastern Georgia. This winery is a joint endeavor between Gogi Dikishivili, a famous Georgian wine maker, and his son Temur Dakishvili. As Gogi is a pioneer in the revival of the use of qvevri, Orgo uses these earthenware vessels for all of their wines. Many of the grapes they source are from old vines, aged 50-80 years, and few other wineries are able to source such grapes. When Georgia was part of the Soviet Union, many of the older vines, which notoriously are low yielding, were unfortunately torn up and replaced, with the intent of increasing production. 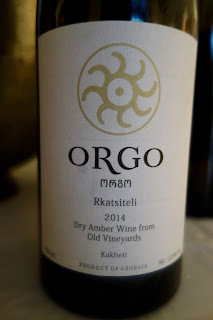 The 2014 Orgo Rkatsiteli (about $20) is made from 100% Rkatisteli, has a 12.5% ABV, and is fermented and aged in qvevri for about six months, with skin contact for that entire period. Referred to as an "amber" or "orange" wine, this wine is also made with wild yeasts and is unfiltered. It has a more unusual, yet intriguing, aroma, a melange of spice and fruit. On the palate, the spice notes dominate with more subtle undertones of citrus and peach and a touch of honey. It is fresh and crisp, complex and well-balanced. Kosta stated they don't don't usually chill this wine as it is so full-bodied. This wine would pair well with a variety of foods, from seafood to chicken, cheese to charcuterie. The 2014 Orgo Saperavi ($20) is made from 100% Saperavi, has a 12.5% ABV, and is fermented and aged in qvevri. This wine is also made with wild yeasts, is unfiltered, and only 5,000 bottles were produced. It possesses an alluring aroma of lush black fruit, herbal notes and a touch of earthiness. On the palate, it is full bodied and lush, with mild tannins, and delicious flavors of ripe plum, lots of spice, herbal accents and an earthy undertone. Harmonious and complex, it possesses a lengthy, pleasing finish. This is a wine for meat, from sausages to lamb, burgers to steaks, or even a hearty Bolognese. 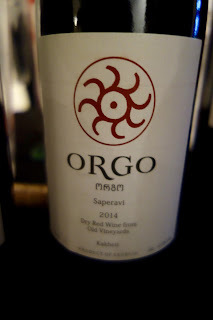 I highly recommend both of these Orgo wines, and they are an excellent introduction to Georgian qvevri wines. If your local wine shop doesn't carry Georgian wines, then ask them to check out the Georgian Toast portfolio. 2) Share Our Strength’s No Kid Hungry campaign and Boston’s culinary all-stars invite guests to join them for a delicious evening benefiting No Kid Hungry. On Monday, October 17, Share Our Strength’s No Kid Hungry Campaign will bring together Boston’s best chefs for a very special evening featuring a cocktail reception, live auction, and a multi-course seated dinner intimately prepared tableside by the biggest names in the restaurant industry. Participating chefs include: Karen Akunowicz of Myers & Chang; Jamie Bissonnette of Toro, Coppa, and Little Donkey; Joanne Chang of Flour Bakery and Myers & Chang; Dante DeMagistis of Restauant Dante; Louis DiBicarri of Tavern Road; Tiffany Fasion of Sweet Cheeks BBQ and Tiger Mama; Will Gilson of Puritan and Co.; Andy Husbands of Tremont 647, Sister Sorel, and The Smoke Shop; Matt Jennings of Townsman; Kevin Long of Empire; Colin Lynch of Bar Mezzana; Tony Maws of Craigie on Main and Kirkland Tap& Trotter; Rodney Murillo of Davio’s; Steve “Nookie” Postal of Commonwealth; Susan Regis of Shepard; Jason Santos of Abby Lane and Back Bay Harry’s; Michael Scelfo of Alden & Harlow and Waypoint; Michael Serpa of Select Oyster Bar; and Meghann Ward of Tapestry. Tickets are tax-deductible and range in price from $1,000 for an individual ticket to $25,000 for a party of 20. Multi-Course Seated Dinner: 7:00 p.m.
OTHER: Please visit http://ce.strength.org/events/boston-no-kid-hungry-dinner for more information and to purchase tickets. 3) Davis Square spot Saloon is celebrating the final month of summer with updated menus that reflect the season’s boldest flavors and the industry’s purest spirits. Executive chef Shayne Nunes’ revamped menu focuses on shareable cuisine to create delicious experience. Newcomer hors d’oeuvres include White Truffle-Honey Popcorn ($4); Caramelized Mission Figs with chorizo, whipped gorgonzola and cider-honey glaze ($8); Grilled Angus Flat Iron with cornichons, watercress and truffle vinaigrette ($12); Poutine with hand-cut potato wedges, smoked cheddar and Applewood smoked bacon gravy; and, Maple Buffalo Wings with bleu cheese dressing ($12). Additionally, Saloon is shucking $1 local oysters every night from 5:00pm-7:00pm through Labor Day. For bigger appetites, there is a trio of new entrees: Grilled Angus Ribeye with seared jumbo shrimp, toasted fingerlings, asparagus and a lemon cream sauce ($30); Hot Fried Chicken with a warm polenta cake, marinated cucumber salad and honey-basil yogurt ($19); and, Berkshire Pork Chop with grilled asparagus, honey grits and a peach-pepper relish ($23). On the spirits side, the beverage team has debuted a menu with a dozen new bespoke cocktails that are available in addition to Saloon’s roster of 120 whiskey selections. Bourbon lovers can order up the Strong Hand with bourbon, Apple Jack, honey, lemon and allspice ($12) or the B-Laz with rosemary-infused bourbon, chai-spiced vermouth, raspberry, lemon and egg whites ($13). Gin enthusiasts might opt for the Grand Optimist with gin, Montenegro, ginger, lemon and Peychaud’s bitters ($11) or the Nighttime Sky with gin, Averna, Amaro Nonino, pineapple syrup, lime and Peychaud’s bitters ($12). Other highlights from the new menu include the What Makes a Man with tequila, Cocchi, yellow chartreuse, Fernet and basil ($13), the Step Side with Carpano Antico Sweet vermouth, Mandarine Napoléon, Fernet, lime and sugar ($14), Holy Mountain with sherry, rum, burnt cinnamon, pineapple, lime and bitters ($12) and Problem Solver with cognac, Cardamaro, Benedictine, Ancho Reyes and bitters ($13). Autumn in New England is the time for apple picking, for hot cider donuts and chilled apple cider. It is a time for home-baked apple pies, cider-braised pork, apple stuffing and so much more. With the prevalence and popularity of apples, it's easy to understand why hard cider is also quite popular in New England, and Vermont is certainly no exception. During TasteCamp Vermont, we had the pleasure to taste a range of hard ciders, some very traditional while others were more experimental. Vermont is cutting their own unique path through the hard cider industry and are producing some fascinating and delicious ciders. No matter what type of cider you prefer, you'll likely find some in Vermont, and if you are willing to expand your palate, you'll find plenty others which should appeal to you. 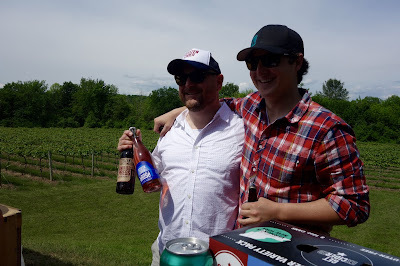 As a cider lover, I was impressed with Vermont's offerings, and brought a number of bottles home with me. The hard cider industry has a long history in Vermont. Even when Prohibition was enacted in Vermont in 1852, 67 years prior to the passage of Federal Prohibition, the production of hard cider was not banned, provided no other fermentable sugars were added to it. However, you couldn't sell cider at any "...victualing house, tavern, grocery shop, or cellar, or other place of public resort.” Why was cedar allowed to remain legal? First, it was easy to make and with "...the abundance of apple trees and orchards across the state, it would have been impossible to outlaw production." Second, cider was "...an important staple of daily nutrition. Consuming water was still a dangerous gamble, and beer produced at breweries was illegal under the law." The effect of Vermont's Prohibition was to significantly increase cider consumption but it must have eventually been seen as a significant problem as they finally outlawed cider production and consumption in 1880. Eleanor Léger, the founder of Eden Specialty Ciders, showcased a number of her ciders, and they were very popular with the TasteCamp attendees. See my previous post Craft Cider-From Orchard To Glass for more information about Eleanor, her cidery, and reviews of some of her tasty products. Eleanor is making exciting ciders and has inspired other producers in Vermont to get into the cider industry. I want to highlight two more of her ciders, both which I highly recommend. The Eden Imperial Rosé ($15) is produced from heirloom apples, red currants, and a touch of ice cider. At 11% ABV, it is off-dry, with a mild effervescence, and is fresh and crisp with delicious apple and currant flavors, blending together well. It is tasty on its own, though would pair well with food too, and this would be great on your table at Thanksgiving. At this price, it is a very good value and I was sure to pick up a couple bottles. I've previously raved about the Eden Orleans Herbal Aperitif, kind of an apple Vermouth, a cider infused with organic herbs including Basil and Hyssop. I stated that it "is an intriguing and compelling cider, a unique blend which has lots of potential." At TasteCamp, I got to sample the companion to this aperitif, the Eden Orleans Bitter Aperitif ($30). The Bitter, with a 16% ABV, is a cider made with red currant, dandelion, angelica, and gentian. It possesses a complex and fascinating taste, with a potent bitterness, enhanced by more subtle hints of red fruit and apple. It is more of an apple Amaro, and should be an excellent ingredient for a variety of cocktails. I was impressed with the Bitter just as much as I was the Herbal and would highly recommend both. They are very unique, quite delicious, complex and versatile. Many of the TasteCamp attendees seemed to agree as Eleanor sold plenty of bottles of the Aperitifs. Whetstone Ciderworks, which is located on the banks of the Whetstone Brook, was founded in 2010 by Jason and Lauren MacArthur. They use apples from both their own orchard as well as some other local farms. Jason, on a trip to France, became enamored with wine making and upon his return to Vermont, he wanted to create something appropriate to the land and climate. Apples, rather than grapes, became his fruit of choice, thinking it best exemplified Vermont and its cold and wet climate. Jason noted that "cider is a delicate beverage" and they usually drink cider with food. The Orchard King ($14) is made from a blend of apples including Jonagold, Pinova, Cox's Orange Pippin and some later bittersweet cider apples. Dry and crisp, it possessed tasty flavors of tart apple and citrus, with a nice minerality. This would be excellent with cheese, and I could also see it working well with seafood dishes, from oysters to cod. The Orchard Queen ($14) is made from a blend of apples including Lamb Abbey Permian, Orleans Reinette, Co'x Orange Pippin and Kingston Black. This too is dry and crisp, with a strong tart apple flavor and mild citrus, but its main difference is that it possesses an earthy element, a complex and intriguing aspect that appealed to me. I would pair this with other umami dishes, from sushi with soy sauce to mushroom risotto. Stowe Cider was founded in 2013 by Stefan Windler, a chemist and biologist, and his wife, Mary. They use Vermont apples and make small batches of their diverse ciders. Their Summer Shandy is a blend of homemade lemonade and semi-dry cider. It is mostly dry, with bright citrus and lemon flavors, a nice tartness and a crisp and refreshing taste. Their Ginger Cider is aged in Vermont Rum barrels, their own version of a Dark n' Stormy. It is crisp and dry, with strong and clean apple & ginger flavors, and caramel and vanilla accents. The Wild Reserve is naturally fermented, made like a traditional Spanish cider, and is earthy and funky, with underlying tart apple flavors. Quite delicious. Citizen Cider was founded in 2010 by Justin Heilenbach (a small farmer), Bryan Holmes (a chemist) and Kris Nelson (a wine salesman). It started off as a small project but quickly exploded so that by 2014, they had created a large production facility in Burlington, Vermont. They produce over 10 different types of cider, a diverse portfolio of intriguing ciders. The Northern Spy is a single varietal cider, made from apples sourced from Happy Valley Orchard. It has a complex and delicious taste, with nice tartness, a hint of sweetness, and is very crisp and refreshing. Citizen Plum Intended is intriguing as it is made with Sake yeast, as well as co-fermented with macerated plums, also from Happy Valley Orchard. It was only mildly sweet, with a subtle plum flavor overlying the crisp, apple flavors. It was delicious and I picked up a couple bottles to take home. In 2002, Bradley Koehler and his wife purchased the Windfall Orchard, a three-acre orchard which now grows over 80 varieties of apples and other assorted fruits. It is currently a small operation, with their only produce an apple ice cider. The Windfall Ice Cider is blend of 30 varieties of apples, including 50% heirloom and 50% traditional cider apples. Some of the traditional cider apples include Roxbury Russet and Esopus Spitenburg. It has a wild fermentation as well as a secondary fermentation, with some ice cider as a dosage. It ends up with a 9% ABV and 15% residual sugar, and tastes mostly dry with good acidity. It has a prominent and complex apple flavor with savory notes. There are also notes of honey, dried fruit and almost ripe pear. An excellent dessert wine. As the end of summer nears, and the cooler weather of the fall approaches, general wine drinking habits tend to change as well. For example, people start drinking more red wines, savoring the heartier wines as temperatures drop. Plenty of people will still drink white wines, from Chardonnay to Riesling, and there's certainly nothing wrong with that. This also makes sense when you consider wine pairings with food, as red wine generally doesn't pair as well as white wine with some dishes. However, one type of wine often gets mistakenly labeled as a "summer wine" and far too many people won't drink it in the fall and winter, despite the fact it can and should be consumed year-round. The situation has slowly improved during the last several years but change is still needed. The myth that Rosé wine is just for the summer needs to be shattered. The media is partially responsible for perpetuating this myth, especially with the pre-summer deluge of articles declaring that it will soon be "Rosé season." These articles lead consumers to believe that Rosé is for summer only. Distributors play their part in this myth, promoting Rosé for the summer, and often stopping their promotion once Labor Day arrives. Too many wine shops stop selling Rosé wine after Labor Day, except to sell off their summer stock, so consumers are hard pressed to find Rosé even if they wanted it. It's interesting that many of these individuals responsible for promoting this Rosé myth actually know better. They understand the truth, that there is absolutely no reason you should stop drinking Rosé just because fall arrives. Rosé is appropriate year-round, especially because it pairs so well with a diverse selection of foods. For example, it works very well with a Thanksgiving dinner. If you can drink white wine in the fall and winter, there is absolutely no reason you cannot drink Rosé too. I drink Rosé all year round and strongly encourage everyone else to do so as well. There are some wine stores which stock Rosé throughout the year and if your local shop doesn't, then you should recommend that they stock some. And if they don't bring in some Rosé, then seek elsewhere for this wine. Share some Rosé this fall and winter with your friends, showing them the potential of this delicious wine. Don't ask if they want Rosé but just pour them a glass. Once they taste the wine, they'll probably come to the realization of what they have been missing. We also need more wine writers to pen Rosé articles during the fall and winter, to persuade consumers that this pink wine is appropriate during every season, and not just during the summer. Raising consumer awareness is vital to spreading a passion for Rosé year round. 1) TAMO Bistro & Bar will be welcoming Santa Cruz’s Bonny Doon Vineyard for a special wine dinner on Thursday, September 8th from 6:30pm-9:30 pm with guest of honor, winery founder and self-proclaimed “vitizen of the world,” Randall Grahm. Bonny Doon specializes in Rhone varietals and practices biodynamic farming. Guests will have the opportunity to experience Randall’s rants on “ugly duckling grape varietals” while enjoying Chef Robert Tobin's spirited four course menu. I have enjoyed many delicious wines from Boony Doon, and Randall Grahm is quite a fascinating personality. This should be a fun and tasty event. 2) Rosebud American Kitchen and Bar invites whisky lovers to join them for a guided tasting through four of Nikka's Japanese whiskies with Gregory Fitch, Regional Vice President of Anchor Distilling Company. Although Scotch has long been considered the standard for quality whisky production, over the past twenty years Japanese whiskies have quietly been changing the way the world sees and thinks about whisky. Nikka is among the top whisky producers in Japan and honors the traditional Scottish production methods, such as using the Coffey still, as well as using innovative and modern techniques to produce delicate yet incredibly complex whiskies. Guests must be 21+. Tickets cost $45 and can be purchased at JapaneseWhiskyTasting.Eventbrite.com. 3) This summer Boston’s newest seafood destination, Saltie Girl, is bringing brunch to Back Bay. The restaurant is bringing tastes of the sea to a carefully curated brunch menu which maintains Sidell’s focus on globally sustainable iterations of fresh fish & seafood be it fried, sautéed, raw, house-potted, smoked or tinned. Every Saturday and Sunday from 11:30AM to 3:00PM, guests can enjoy creative interpretations on brunch dishes prepared by the talented Chef Kyle McClelland. In addition to the regular menu, Chef has added two unique entrees including Eggs & Eggs, soft scrambled eggs and caviar served with butter brioche, and Bagel Benedict with avocado, poached egg and house béarnaise served with a choice of smoked salmon, caviar paddlefish or lobster, as well as a savory side of Pork Belly Bacon. Saltie Girl’s regular menu will also be available all day long including dishes such as the Fried Lobster & Waffles served with sweet corn butter and spicy maple syrup, the Gloucester Lobster Roll mixed with chive, parsley, Japanese mayonnaise and Meyer lemon juice served hot or cold on a buttered brioche roll with house-made salt & vinegar chips, and the Saltie Girl Burger, a three beef blend topped with gruyère, avocado, fried lobster, house cured pork belly and angry or classic sauce. Do you like to pour maple syrup on your pancakes or waffles? Do you enjoy maple & bacon doughnuts? Do you love maple squares for dessert? If you answered affirmatively to any of those questions, and even if you didn't, you might want to consider trying some alcohol made with maple syrup. I think you'll be quite surprised at how delicious such drinks can be. At TasteCamp Vermont, we got to experience a number of maple-syrup based drinks and it was eye-opening to learn the diversity of those compelling products. It shouldn't be a surprise that Vermont would embrace maple-syrup based drinks as they are the country's largest producer of maple syrup, with over 1500 sugarhouses, making about 1.3 million gallons, approximately 42% of all the maple syrup made in the U.S. The history of maple syrup production extends back to the Native Americans, who probably taught Europeans how to make it. Producing maple syrup is a relatively easy process. First, you place a tap into a maple tree and wait for the sap to drip down and accumulate in your container. Once the sap is then collected, i will be boiled until it becomes syrup. It will take approximately 40 gallons of sap to make 1 gallon of syrup, meaning that over 52 million gallons of sap must be collected! The maple syrup, which is then about 67% sugar, will be filtered and bottled. It is simple enough that you could make your own maple syrup at home. At one of the group tastings, I tasted some "fermented maple syrups" produced by Erin Hunter of Fernleigh Cellars. Unfortunately, I tasted these intriguing items near the end of the tasting so I didn't have much time to speak with Erin. I thought I could later check her website but later found she doesn't have a website, just a Facebook page. And online research doesn't turn up much information about the winery or Erin. It is something I need to follow up on, to potentially interview Erin for more details on her winery because her products are amazing and unique. The Tapper's Maple Mead ($20) is made from honey and raw maple sap, and contrary to what you might think, it was more dry in style, with an interesting blend of floral and herbal flavors. It was quite tasty and intriguing, ask well worth checking out. Erin is currently working on producing a sparkling version of this mead. Next, I moved onto tasting three Fermented Maple Syrups. and overall, I found them to be well balanced and fascinating, delicious and complex. The maple element didn't overpower and I actually found that two of them reminded me of a good Sherry! These would be delicious on their own, but I could also see how they would work well in a cocktail too. The Maple Reserve Amber ($28) was smooth and easy drinking, with a mild sweetness balanced by a saline character, a nice combination of sweet & salty. It was the lightest of the three fermented maple syrups, but still possessed a good complexity and a lengthy finish. This would make an excellent after-dinner drink, though it might also pair well with some spicy fare, or even fried foods. My favorite of the three was the Maple Reserve Special Dark, which reminded me of a sweet Oloroso Sherry. Again, it had a sweet & salty taste, with nutty notes and even some minerality (which was quite surprising). Complex and delicious, the pleasing finish lingered for a very long time. I was mesmerized by the flavors in this wine, amazed that maple syrup could create something this good. I'm not sure if you blind tasted someone with this wine if they would guess it was made from maple syrup. Highly recommended. There is also a Barrel-Aged version of the Maple Reserve Special Dark, which is aged in whiskey barrels. This wine is darker in color, with fuller flavors including some chocolate and spice notes. It didn't remind me of a Sherry but is more similar to some Ports without any of the fruit flavors. Unfortunately, Erin didn't have any of her wines available for sale at the tasting or I would have bought several. However, the next time I'm in Vermont, I will be seeking out some of their maple syrup wines and you too should seek them out. I first encountered the wines of Boyden Valley Winery back in 2009 at the Vermont Cheesemakers Festival and was impressed with what I tasted. The Boyden Farm is located in the Lamoille River Valley and has been family owned for four generations. The winery is inside a restored 1825 carriage barn and their vineyard has about 8000 grapevines. They produce European-style wines, including fruit wines, grape wines, dessert wines, specialty wines and hard ciders. At TasteCamp, they showcase their Vermont Ice Maple Creme Liqueur ($30), which is produced from their estate maple syrup, apple brandy (made from Vermont apples) and real cream. This liqueur is creamy and smooth, with a mild maple taste which doesn't overwhelm. It has s rich mouthfeel and tastes much better than some of the big commercial cream liqueurs which aren't made from natural ingredients. A perfect ending after dinner, or it would be an intriguing ingredient for cocktails too. Highly recommended. One of the most unusual maple-based drinks was produced by the Appalachian Gap Distillery, which is located in Middleburg, Vermont. They produce a variety of spirits, including rum, whiskey and coffee liqueur. They also make Papilio, named to honor the state butterfly, which is a blend of blue agave nectar and maple syrup! You could almost think of it as a maple-flavored tequila, though obviously as it isn't produced in Mexico it cannot be called a tequila. The spirit is composed of 80% Organic Blue Agave Nectar from Jalisco, Mexico, and 20% Dark Maple Syrup from Cabot, Vermont. It was interesting, a relatively smooth, sweeter form of tequila with maple notes. It is cool to see how a number of Vermont producers are using maple syrup, such an important local ingredient, and creating some delicious and intriguing beverages. Most of these drinks may never be available outside of Vermont, so it is an added incentive for you to visit Vermont and explore the bounty of what that state has to offer. Twenty-five Burgers fought each other in a battle royale, seeking to become the Champion, the people's Favorite Burger. Amidst all the carnivore carnage, who reigned supreme? Who created the Best Burger? This past Wednesday, Boston Magazine hosted the 5th Annual Battle of the Burger, a grand competition and homage to the ever-popular burger. Twenty-five restaurants and chefs competed, each offering their own unique take on the burger. You can check out the list of competitors and see which burgers sounded appealing to you. I attended this event, as a media guest, sampling the many burgers, enjoying the beverage options, and selecting my own list of the Best Burgers. Once again, the event was held at the Cruiseport Boston and as the weather cooperated, with the rain having stopped, it was pleasant to be able to stand outside by the water, sipping some wine or a cocktail. With all of the grills operating in the main dining area, it did get a little smoky and warm in there so it was great to have an area where you could get some fresh, cool air. This year, after being the Battle of the Burger Champion for three years in a row, Chef Matt O’Neil of The Blue Ox in Lynn was retired as a competitor. This opened up the competition to a new Champion, making it even more competitive than usual. Who would prevail? Inside the building, there were a number of booths offering beer, wine cocktails, pickles, ice cream, and more. Grillo's Pickles offered samples of their Italian Dill, Hot Italian Dill and Bread & Butter pickles. Rancatore's Ice Cream presented several different ice creams and sorbet, with a table of toppings, from nuts to chocolate sprinkles, you could pit atop your cup of ice cream. I enjoyed their creamy Coconut Sorbet. Georgetown Cupcakes offered numerous mini-cupcakes as a sweet treat after all the burgers. In the burger section, there were a couple non-burger options too, from a pizza truck to fresh baguettes. I was impressed with the Late July Snacks Sweet Potato Multigrain Tortilla Chips. They were thick, crunchy and flavorful, with a nice spice to the taste. I'll have to seek these chips out at the local supermarket. Barton & Gustier presented a few different wines, including a delicious Provence Rosé. Mount Gay Rum was one of the sponsors and you could sample their tasty Blended Rum Punch, which was made with Mount Gay Eclipse, Mount Gay Black Barrel, Pineapple Juice, Orange Juice, Grenadine and Angostura Bitters. A Chef Ming Tsai Bobblehead? Chef Tsai is on the National Advisory Board of Family Reach, a charity whose mission is "to provide financial relief and heartfelt support to families fighting cancer. The majority of funds are dedicated to families with a child or young adult who is being treated for a pediatric or other type of cancer." Chef Tsai was present at the Burger Battle, helping to raise money for this worthy charity and a donation could get you one of those bobbleheads. In the VIP area, the Chef Tsai and Family Reach booth also offered tastes of a Dark & Stormy Granita, made with Mount Gay Rum. This was a refreshing and delicious "slushy" and I wish I could have savored a large glass instead of these tiny paper cups. I'd already been contemplating making some frozen Dark & Stormy cocktails at home, and this solidified my decision. This year, there weren't any Veggie Burgers, which might mean that maybe the chefs believe they can't compete on the same field as burgers made from meat. They might taste good but it seems that in a Burger Battle, with a diverse selection of attendees, meat is most likely to reign supreme. Nearly all of the entries were also made with beef patties with two primary exceptions, a ground Andouille Sausage & Beef patty from Burton's Grill/Red Heat Tavern and a Lamb burger from ArtBar. Most of the chefs provided sliders, though a few offered full-size burgers, like Tasty Burger, and others provided you a sliced section of a full-sized burger, like City Streets Restaurant. Some of the chefs also provided small sides with their burgers, such as popcorn, chips and mac n' cheese. Attendees got to vote for their favorite burger. placing their voting token in their chosen Budweiser box. What makes a burger the Best? There is really no objective standard as it is very much a personal decision, based in part on your own definition of what constitutes a great burger, as well as your own personal preferences. For example, maybe you dislike brioche buns, onions, or mustard, and if a burger possesses any of those elements, it won't rank as your Best. For myself, I feel that a Champion burger should be something you would savor and want to order on a regular basis. A one-trick pony burger might be exciting for the moment but it won't satisfy in the long run. It wouldn't be something you would order more than once. A champion needs to be able to stand the test of time, to continually deliver a delicious burger each and every time. To illustrate this point, consider Chef Paul Malvone's, of the Boston Burger Company, Whiskey Tango Foxtrot burger. It is made with 80/20 certified Angus beef with homemade mac n' cheese, pulled pork, onion ring, homemade BBQ sauce, and Grillo's pickles. This is an over-the-top burger, and actually tasted very good, but it's not the type of burger I'd order on a regular basis. It is definitely worthy of a splurge when you are feeling especially decadent. The burger itself gains kudos for being thick, juicy and flavorful. For myself, I also feel that a Champion burger needs balance! It is a delicate balancing act, to ensure all the different ingredients of the burger, from the bun to the condiments, contribute to the whole rather than become too dominant on their own. The burger itself needs to be the star, and everything else should play a supporting role, with none upstaging the others. My favorite burgers at this event all possessed a nice balance of ingredients. This year, the attendees voted for Joe's American Bar & Grill to be the Battle of the Burger Champion. The winning entry, from Chef David Forbes, was their Smoking' Granny Burger, a beef burger topped with Nueske’s thick-cut maple-Cajun bacon, aged cheddar, smoked blue cheese, and Granny Smith apple relish, on a brioche bun. I enjoyed this burger, though felt that the tart apple pieces were a little overpowering to the whole. I should also note that they were offering attendees a free bag of swag for anyone who voted for their burger. My choice for the Battle of the Burger Champion was A&B Burgers, where Chef Kwasi Kwaa offered the Sweet & Salty Cow, a beef burger with fig spread, Leidy's bacon, Burrata cheese, and arugula on a brioche bun. The burger was thick and juicy, and was definitely the star of the sandwich, enhanced by the balance of sweet, salty and creamy elements. At last year's Burger Battle, first tasted their burgers and felt that they would be a strong competitor this year too. During the past year, I've savored a number of burgers at their Beverly restaurant, and their Sweet & Salty is my favorite. If you haven't dined here yet, you need to make the trip to Beverly. For Second Place, I have to give kudos to Chef Brian Dandro of ArtBar for his Lamb Burger, topped with whipped feta and chimichurri. I love lamb but know it is also a divisive meat, one that people usually either love or hate. There often seems to be little middle ground. Thus, in a competition like this, it is unlikely a lamb burger, no matter how well made, is going to win the popular vote cause of the number of people who dislike lamb. For a lamb lover though, this burger would impress. The burger itself was juicy and flavorful, with that distinctive lamb taste, a pleasing gamey/earthiness, enhanced by the feta and chimichurri which didn't overpower the sandwich. If anything, maybe there could have been a little more whipped feta atop the burger. For Third Place, kudos go to Chef Shayne Nunes of Saloon with his Saloon Rodeo Burger, made with a USDA prime burger blend, maple smoked cheddar, whiskey BBQ, and crispy shallots on a brioche bun. The whiskey BBQ sauce was flavorful with a mild spicy kick and the crispy shallots added a nice crunchy texture to the burger. It would have been nice to have a couple fingers of whiskey, maybe a spicy Rye, with this burger.